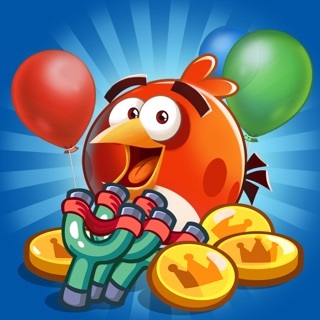 Use your balloon-bustin’ skillz to outsmart the pigs and save birds in over 1000 egg-celent levels! Find the smartest way to solve puzzles, crack high scores, and earn three stars. Grab rewards every day in the Daily Quest. Already got ’em? Then go join the weekly events or chase down this month's puzzle pieces. Blasted through those? How about taking on the world in the global leaderboard? · 1000+ FUN LEVELS – with more added weekly! · CREATE BOOSTERS – rockets, bombs, laser guns! · DAILY CHALLENGES – earn free rewards and boosters! · WEEKLY EVENTS – Mighty League, Treasure Hunt and more! · PUZZLE CHASE – find pieces to new puzzles every month! Get your BLAST on with a new update! Stay tuned for more new features, events and levels! Our feathered friends don’t hold back in this balloon-busting puzzler. It’s got all the manic energy we could’ve asked for—popping pigs and freeing birds feels just like an Angry Birds game should. Mixing explosive power-ups and blasting our way to a three-star finish makes us smile every time. Always a problem with Facebook friends.. I am up in the game - almost to level 200 but I have NEVER been able to connect to Facebook friends. If I log out then I can see all of my Facebook friends - if I log back in to Facebook on the game then all of my Facebook friends are gone. I do not spend a dime. If I run out of game play I just wait and if I fail to pass a level I keep playing the same level until I eventually pass it. You do not have to spend money if you are patient. With all of the updates I have never been able to enjoy this game with its full potential - please fix the Facebook friends problem. Would be nice if I can continue to play without constantly having to update. And if I don’t update, I’m forced to not be able to play. Lives are wasted because levels become too intense, or glitch from time to time and then you lose another life. The only time I can play as much as I want is when they offer the free 24 hour play. I’m very upset I cannot play this game without updating. I do NOT want to update at this time. Even though it’s a free game, if my card attached to Apple Pay isn’t in good standing, I cannot update. Considering finding a new game to play, until Rovio or whoever responsible can allow a bypass from the update and continue to let me play until I am ready to update. Very frustrating, a lot of changes need to be made. I’ve played this game faithfully for over a year now and am in the 800s. I do not wish to update at this time, please allow me to continue to play- or I will not play anymore and write more reviews to warn others that this is a waste of time to play as well. 3 Slingshots and 115 Gold - 75% Extra Free!